While I won’t have anything close to a professional work area, I decided to work on it so that I could feel a little more organized for a new year of making. I started working on this just before the end of last year so I’m pretty much already settled in with some work area improvements. Things may get shifted around with some new parts arriving in the coming weeks but I’m pretty satisfied with how things turned out. My desk, which I’ve been using from elementary school through college, came with these cheap cardboard drawers. I never used them for anything meaningful so I emptied them out and put them to much better use by organizing my electronics parts. 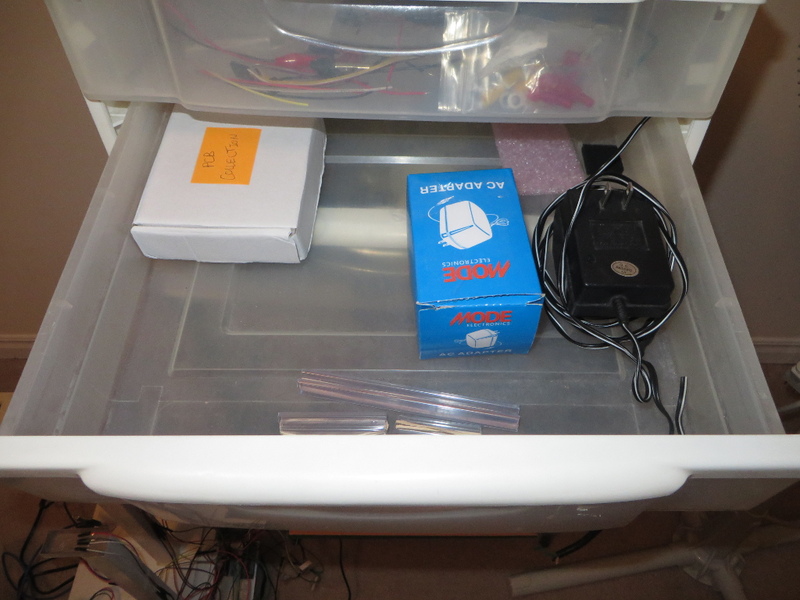 The space underneath the drawers has my multimeter and little cardboard bins with different types of batteries. The bottom right drawer is opened faced because the plugs are in the way of it pulling out… I divided the drawers by cutting pieces of cardboard and taping them in place. I really like how it turned out. 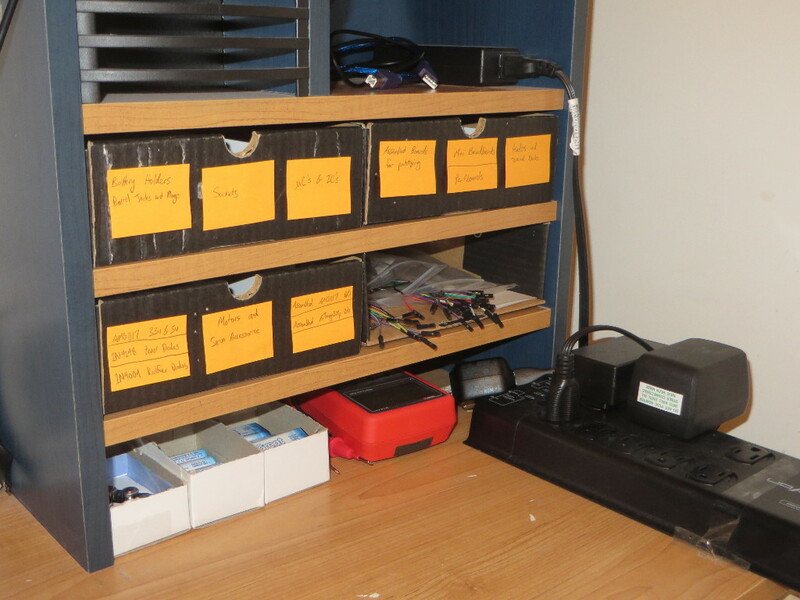 One thing I really disliked about my storage spaces was my old way of storing my resistors. I made a kind of rolodex using pieces of paper with groups of resistors taped on. 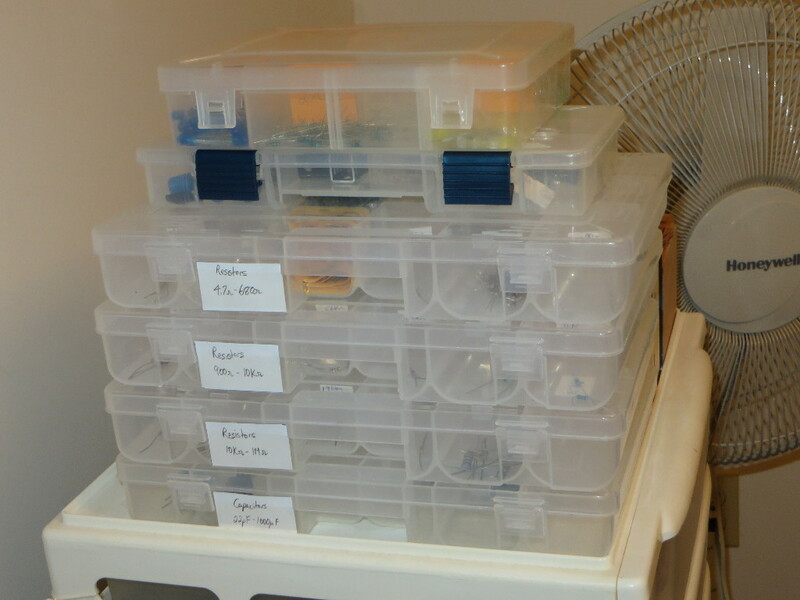 It was a huge pain actually retrieving a resistor from it because I’d have to deal with the tape, so I went to Dollarama and bought a bunch of these organizer boxes. The new ones fit all of my resistors and capacitors. The other two boxes sitting on top are ones I got earlier. One holds my LEDs, the other holds small components like oscillators, transistors, and regulators. 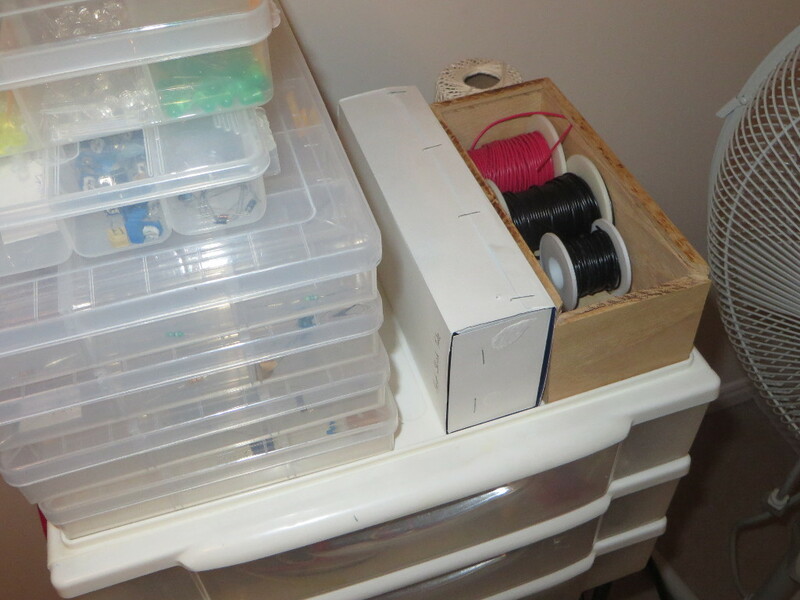 The white box (inside out Q-Tips box) holds shrink tube, and now the wooden box holds my spools of wire. 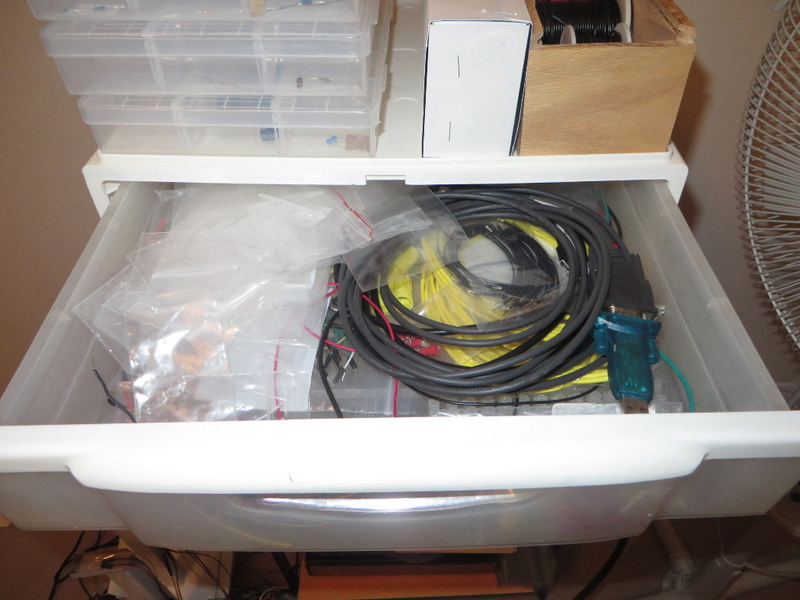 The top drawer stayed pretty much the same as it’s dedicated to my plastic bags, and wires and cables I never use. 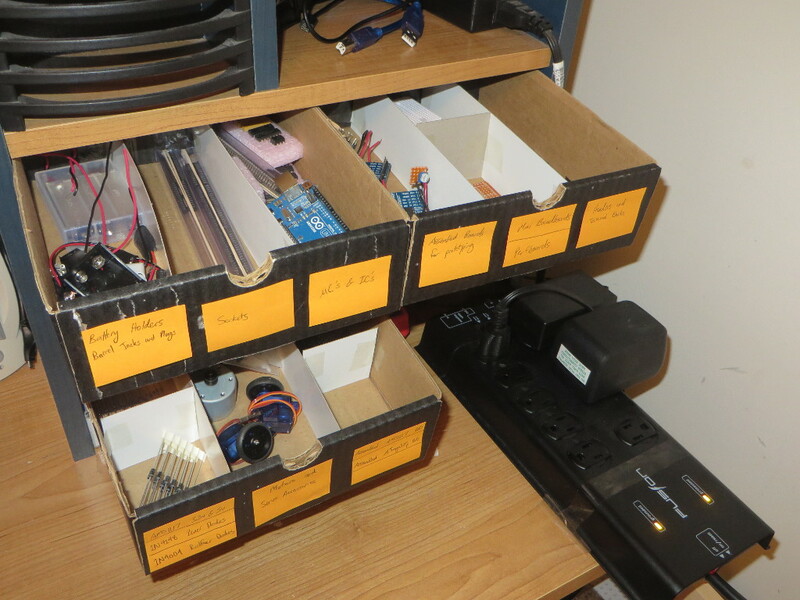 The second drawer had pretty much all of the things that ended up in my cardboard desk drawers. 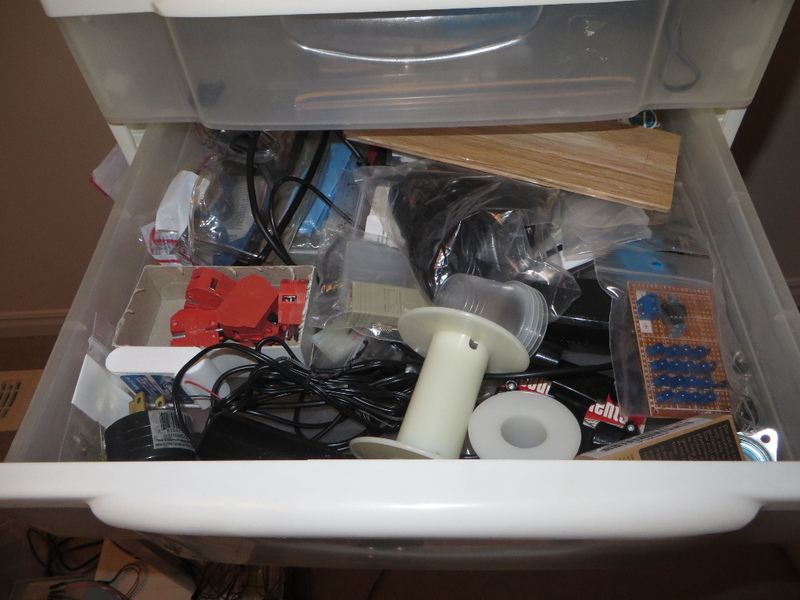 The last drawer is still my disaster area, with “everything else” stuffed in it. I’ll probably go through it and maybe split the contents with the second drawer now that it’s so bare. 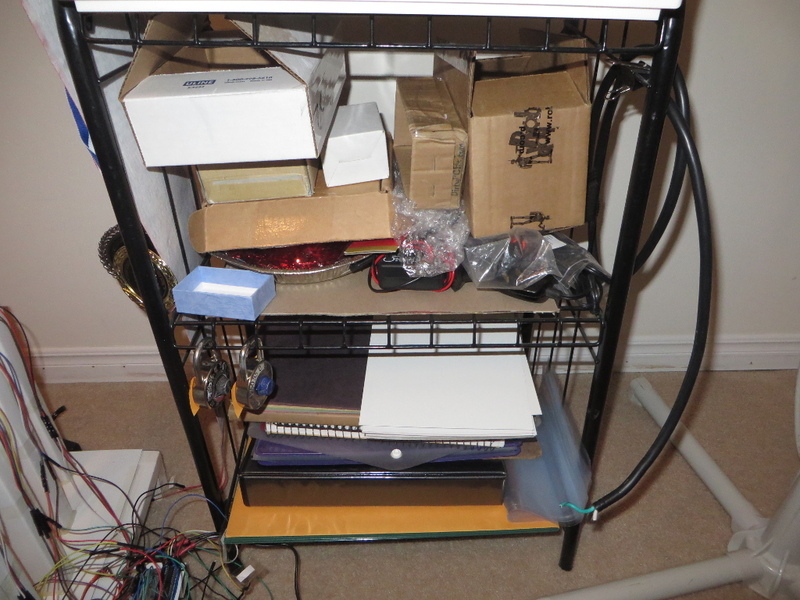 The wire shelf that the plastic drawers are sitting on also remain pretty much the same… Cardboard, old soldering irons, and binders. There’s not much I can do about it so it’s fine. 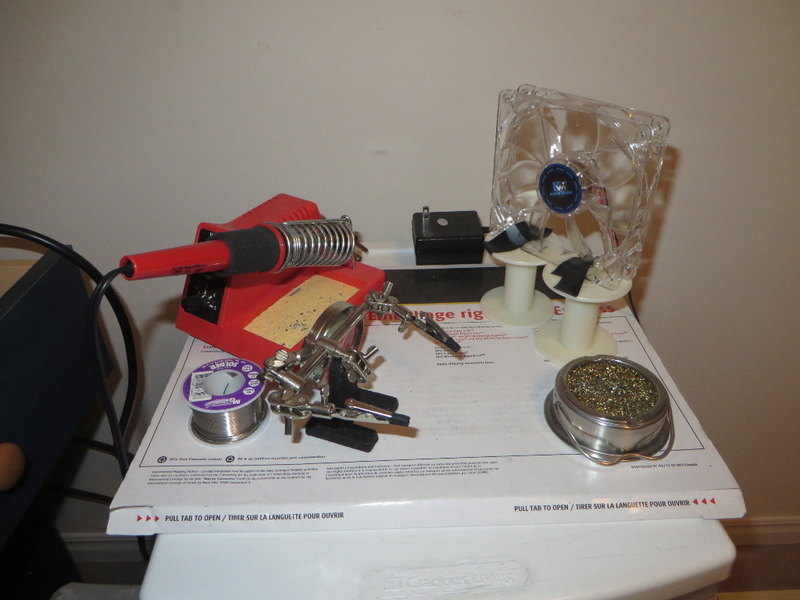 I’ll cap this post off with my depressing soldering area. So that’s the reorganization of my workspace! It may not seem like much but I’m happy with it and it has me excited to put it to use. I have a bunch of things on its way for some new projects so stay tuned. Thanks for reading!